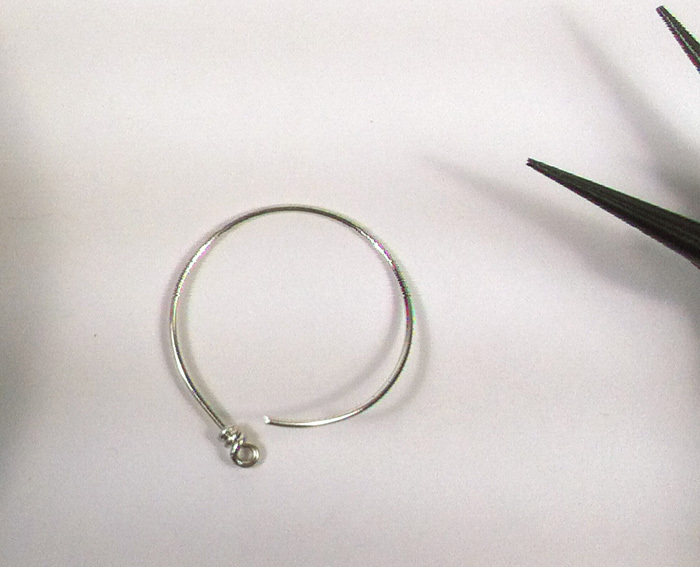 I have been slowly adding to my metalsmithing supplies and have finally reached a point where I am able to make rings (well, almost, I do not have a ring mandrel yet). 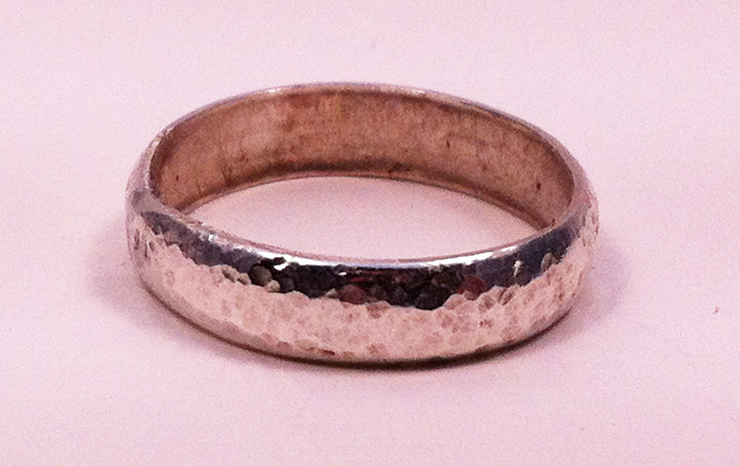 I made my very first 4mm sterling silver, hammered ring today. As it is my first attempt, I already see many things that I can improve upon, but for a first try, it isn’t half bad, especially since it fit from the beginning. I did not have to make any size adjustments. 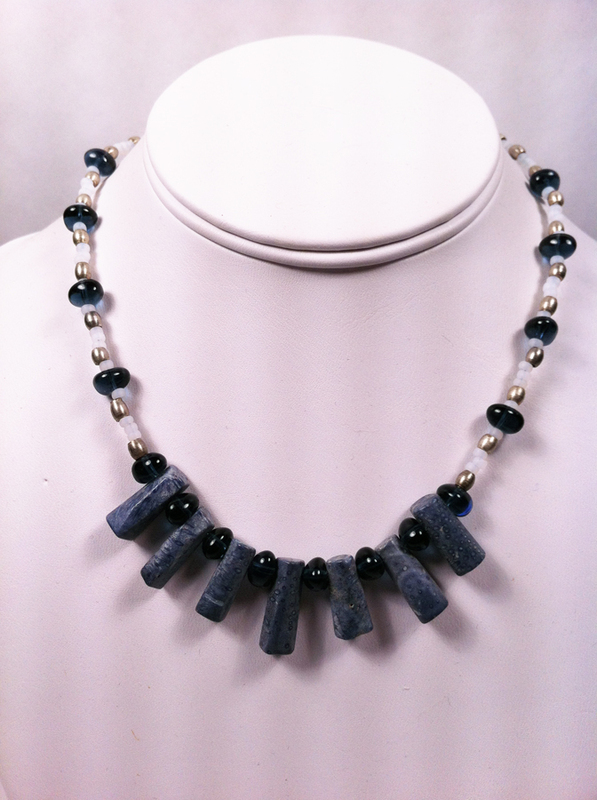 I will have no qualms about wearing it until I make a better one. After putting my photo lights to rest, I realized that the inside of the ring could have used some polishing and the outside could have used some additional polishing, but you get the idea. I have had this idea for a ring for years. It is to be my anniversary ring. I thought that it would be much more fun to make one rather than to buy one. No, this is not it, but it is the first step in my plans. Now, I just have to practice making rings. It is going to be a fun year getting everyone’s ring sizes for Christmas presents next year! 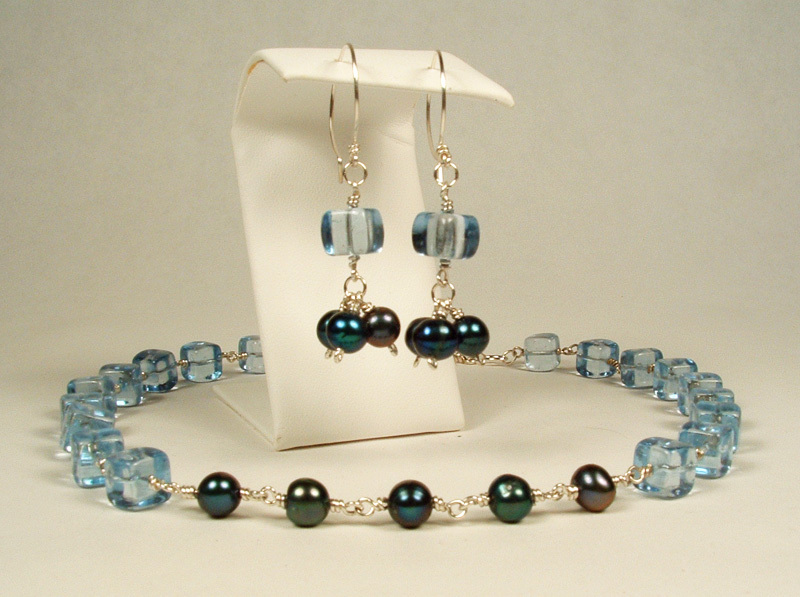 I love matching earring and necklace sets. As far as I am concerned, you can never have too many. 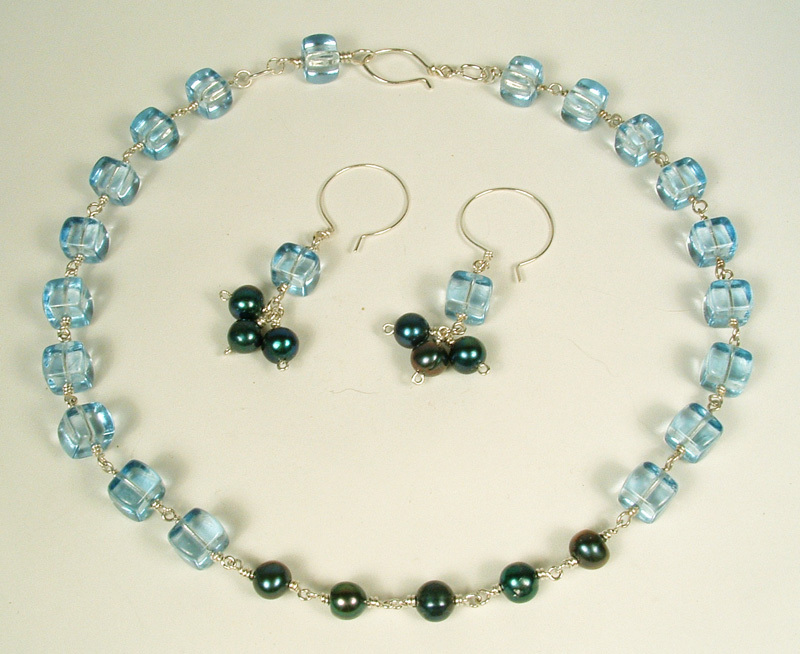 I made the following earrings and necklace out of sterling silver for the earwires, wire hoops, and necklace hook, blue glass and zinc tube beads for the drops of the earrings, blue coral, blue glass, zinc tube beads and white seed beads for the necklace. 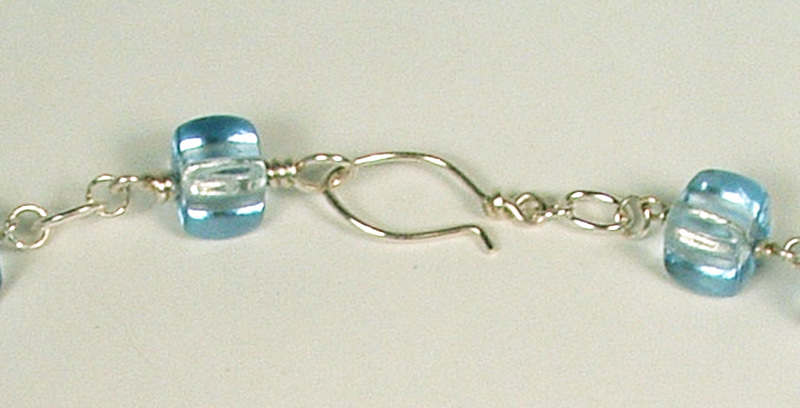 You cannot see it, as it is the back of the necklace, but I used a small length of sterling silver chain to make the necklace a variable length. I wear a LOT of blue and wanted to be able to wear this with many different styles of shirt. 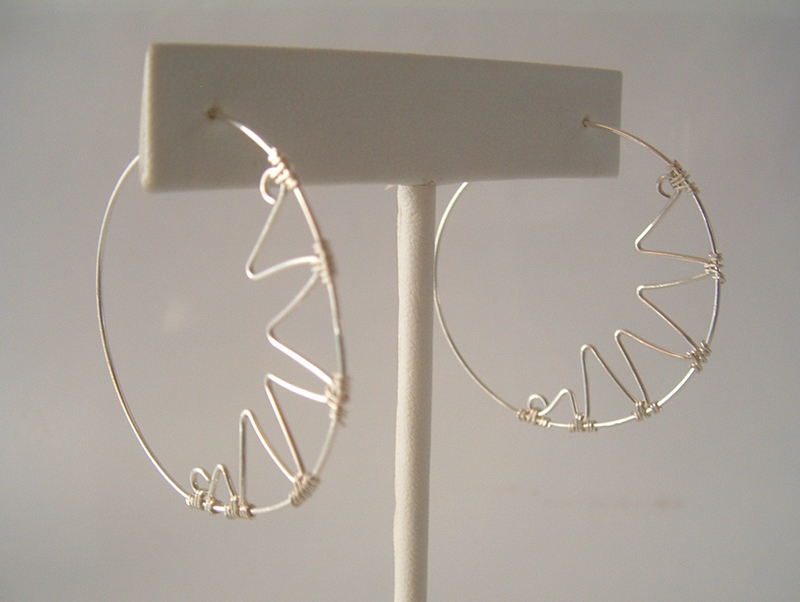 I just love this shape of ear wire. 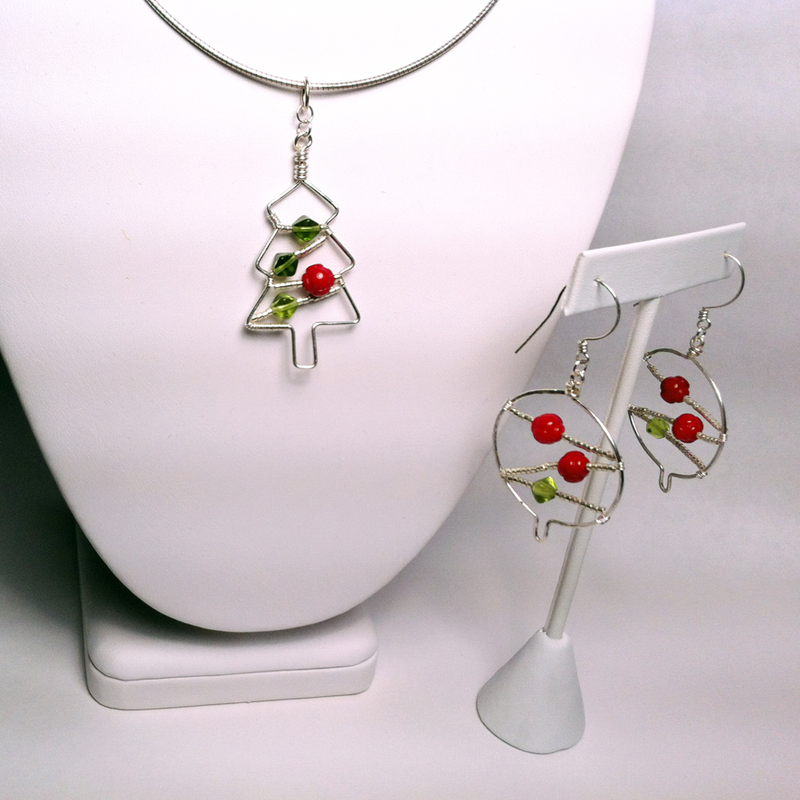 New and interesting shapes for ear wires are very popular lately. 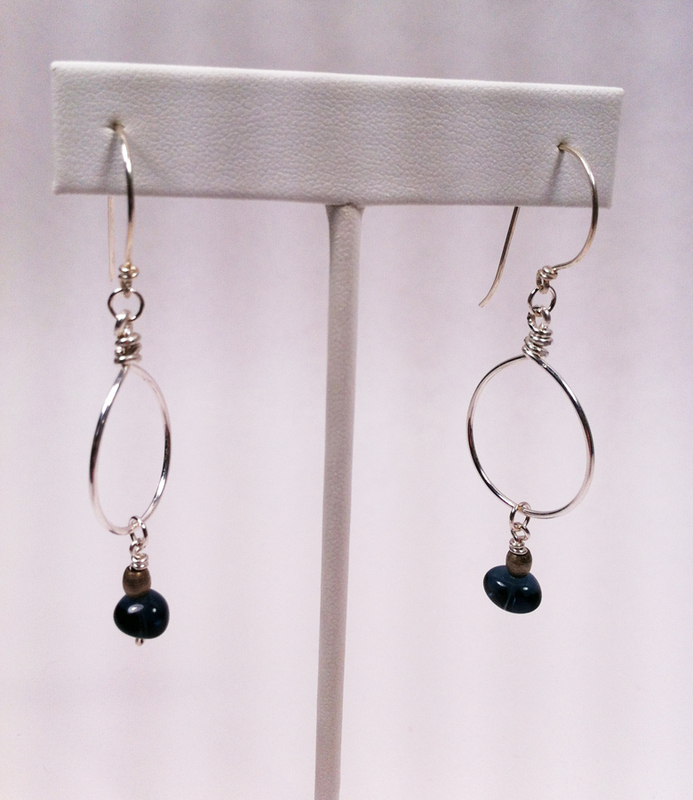 My favorites are the almond-shaped ear wires.These have been featured all over the web and television. 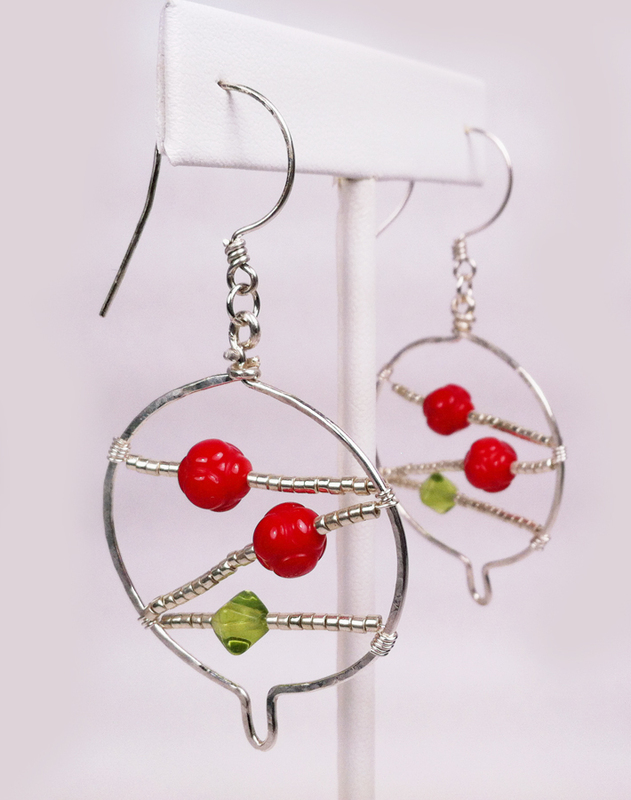 The first time I really noticed them was on Emily Deschanel in the television series “Bones.” They are elegant and fun and are actually very easy to make. For demonstration purposes and because it photographs a little easier, I made these ear wires out of heavier 18 gauge sterling silver half-hard wire. I usually use lighter 21 gauge sterling silver half-hard wire, but I wanted something that would be very visible in the photos. Bend the wire to 90º. Using flat nose pliers (although you can use the rosary pliers for the whole project if you prefer) I bent the wire at 3/4″ to a 90º angle. 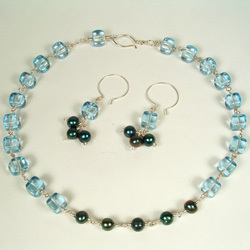 Wrap a loop with the rosary pliers. Then I used rosary pliers (also called round-nose pliers) to make a loop by placing the pliers above the bend on the short wire and wrapping it around the nose of the pliers. Finish wrapping the short end of the wire around the stem. 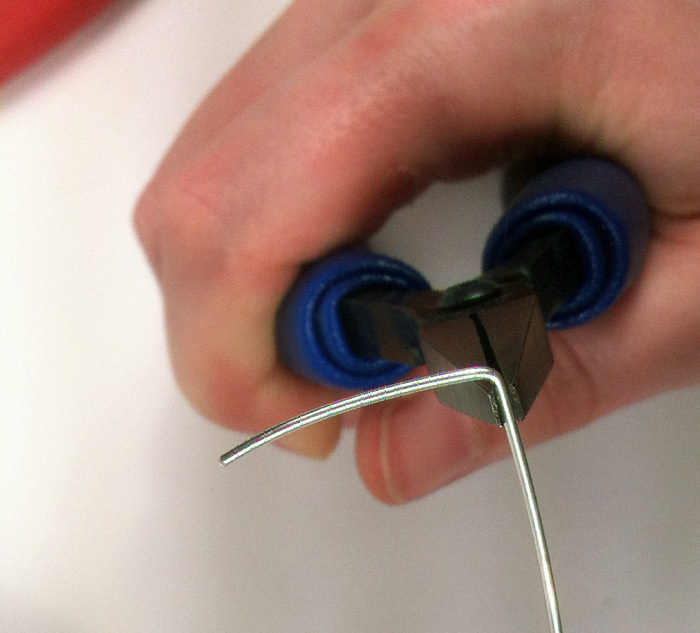 Holding onto the loop with the rosary pliers, I use the flat nose pliers to twist the short end of the wire around the stem (below the loop). 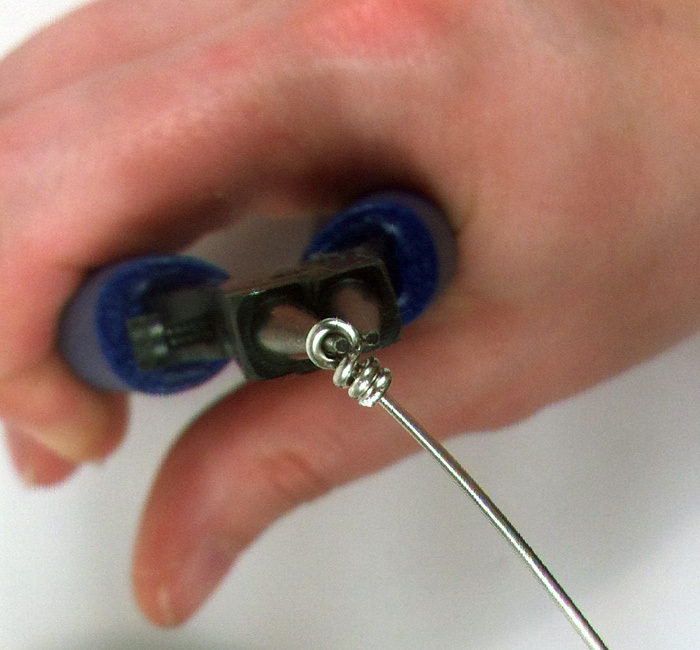 By having only 3/4″ of wire for the loop, there is no wire to trim and you are good to continue on to the next step. 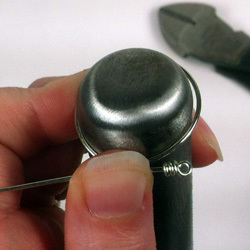 Wrap the wire around a mandrel or other object approximately 1" in diameter. Here I used a mandrel that my father made me for Christmas a few years ago (Aren’t fathers wonderful?). The widest end of the mandrel is 1″ in diameter and the thinnest end is 1/2″ in diameter. For these ear wires, I wrapped around the widest point of my mandrel at 1″. 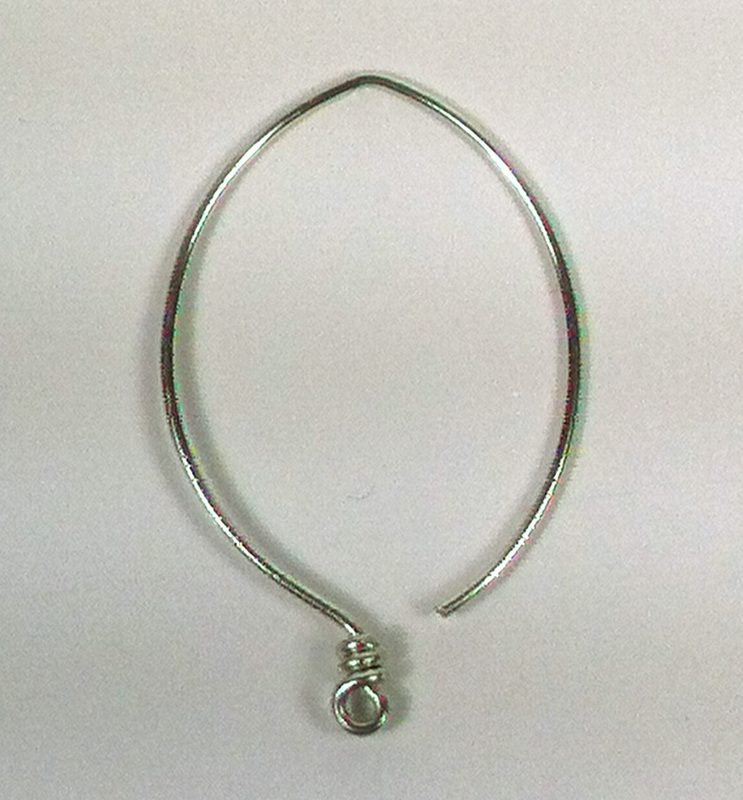 I just made one wrap around the mandrel and as the wire is half-hard, it stretches back out to an incomplete circle when I let it go as shown in the photo below. 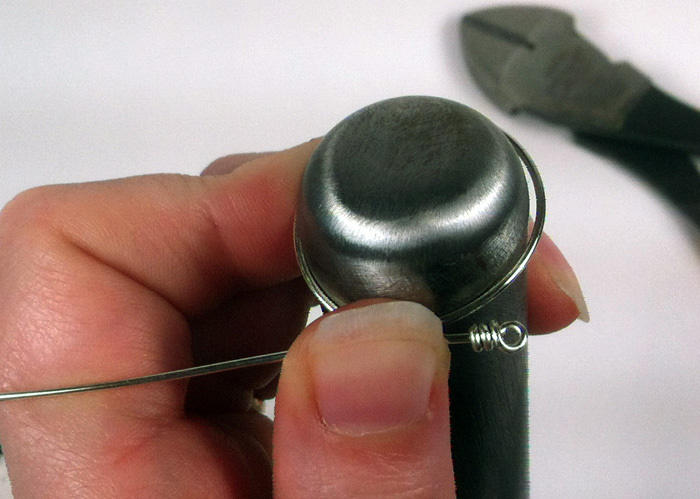 Wire just removed from the mandrel will stretch out to form an incomplete circle. 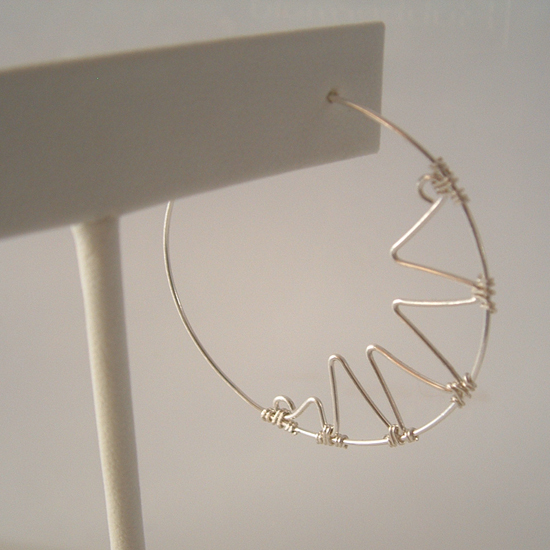 Here is the finished view of the almond ear wire. Next, I bend the circle at the half-way point to create the top of the almond and lightly stretch out the two halves to create the full almond shape. I also bend the wire-wrapped loop to hang correctly down from the almond. 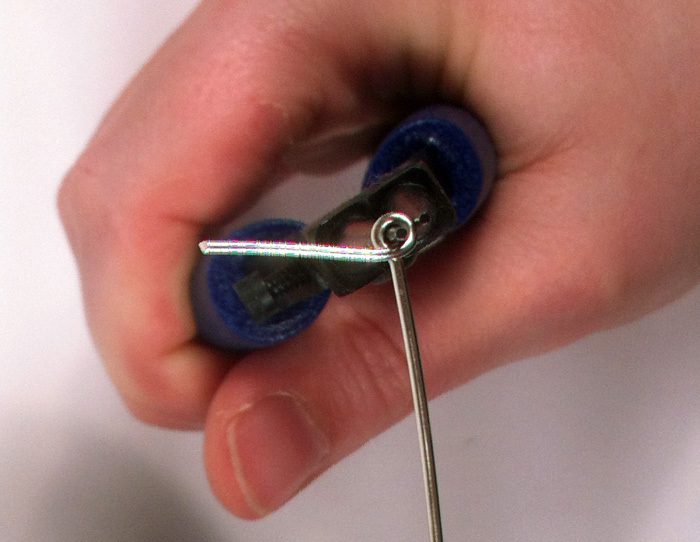 I then use a small file to smooth the cut made by the wire cutters so it won’t catch in your ear when you put it through. 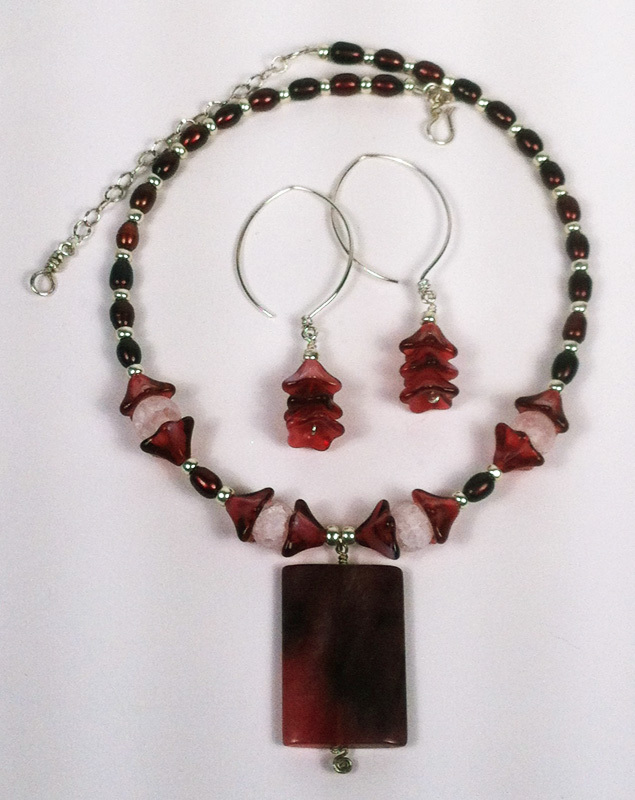 To show the ear wires in action, I made the matching earrings to a necklace I made from pretty pink glass florets, red pearls and crackled white quartz beads. 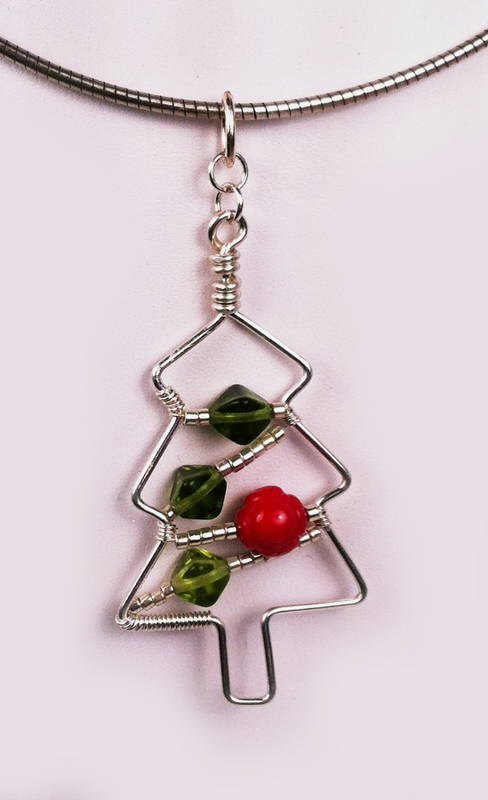 The pendant is a piece of dyed jasper that I wire wrapped to hang it from the necklace. 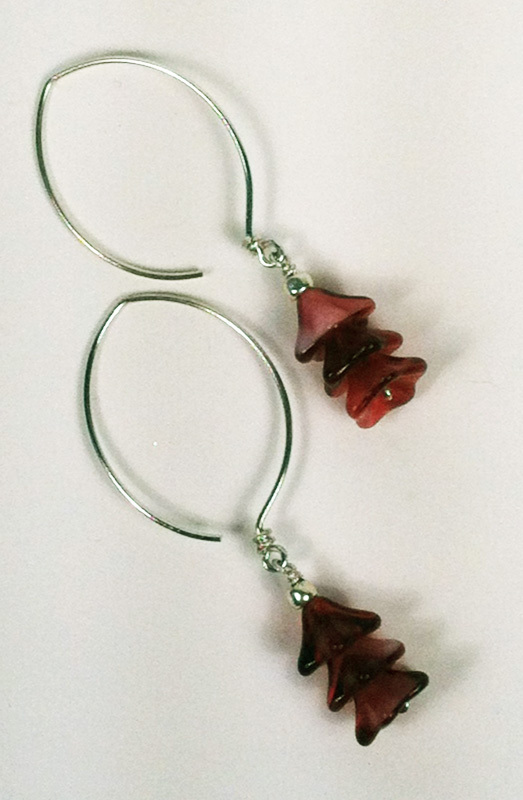 I hope this helps you to create your own almond ear wires, or inspires you to create your own new shape entirely!